Pure, raw Diatomaceous Earth health and feed supplement for humans and animals. 100% natural, food grade, fresh water and certified organic. DIATOMACEOUS EARTH (DE) is a natural health and feed supplement for human and animal consumption. DE is also a natural alternative to eliminating and preventing parasites on and around your livestock. DE is a wonder cure-all silica fossil flour with a multitude of uses and is death to bugs. Poultry, pets and livestock can be dusted or brushed in DE as a chemical free aid to rid them of external parasites such as fleas, ticks, mites and lice. DE works by sticking to the insect as it comes into contact with the powder, and the sharp, tiny particles cut through the insects' exterior and absorb their bodily fluids and they die of dehydration. To apply, place about a handful in the foot of a cut-off pair of pantyhose, tie a knot to contain and pat the chicken all over, making sure to cover every part of the body (avoiding the eyes - DE is a desiccant and absorbs moisture), paying particular attention to the vent and under the wings. This is the no-mess way and will reduce wastage and avoid yourself becoming covered in powder. Store the sock in a container, ready for next time, and refill as necessary. For added effect, combine two parts Diatomaceous Earth with one part Flowers of Sulphur, which is a non toxic and natural miticide. Using our puffer dispenser, puff DE around the chook house, in the floor litter and sprinkle beneath the straw in nesting boxes and along perches and crevices where insects may hide. The powder is completely safe and will not contaminate your eggs. Don't wait until you have mites. Do this as a routine preventative measure. By adding DE to their dust bath, your chickens will inadvertently eliminate any parasites without even realising and save you the hassle of individually dusting each bird. DE can also be mixed with water and used as a spray - two tablespoons to 2 litres of water and sprayed in and around the hen house to control spiders, mosquitos and other insect pests. This spray can also be used on your plants and vegetables and is completely safe. We have never had a green beetle on our tomatoes since using this product. 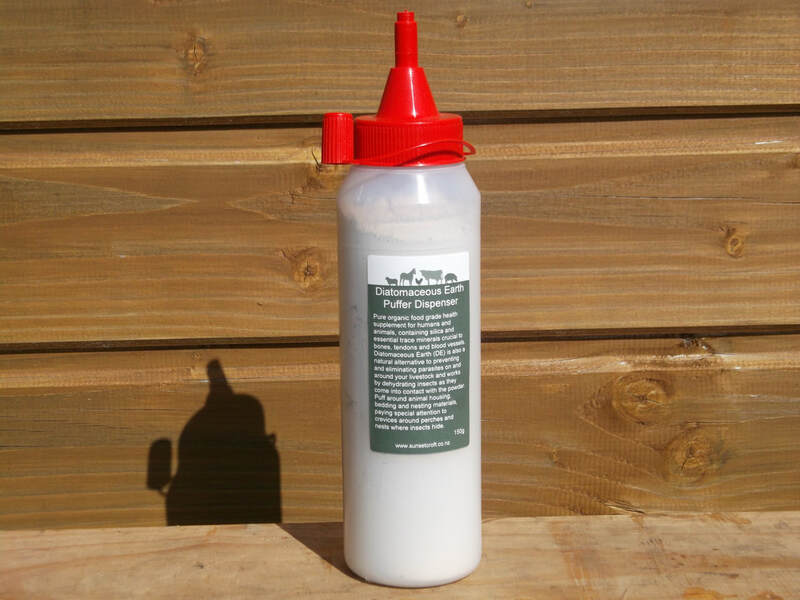 Our pure, organic, food grade Diatomaceous Earth is packaged in a handy puffer dispenser or a 500g resealable pouch and is suitable for organic gardening, insect pest control and as a dietary supplement for animals and humans. Our 150g Puffer Dispenser makes it easy to apply to animal housing, targeting crevices and corners. Comes full with 150g Diatomaceous Earth. Empty bottle also available $6.00 each. Diatomaceous Earth 500g resealable refill pouch.